There are only four crops, but all of the crops can be grown during Spring, Summer, and Fall (not in the Winter). To buy the seeds go to Lyla's Flower Shop to buy them. Each bag comes with one individual seed. The way you plant them, it is set up in rows of eight. There are two rows right next to each other in one group, and there are four groups in all, making that a total of 64 crop spaces. You only need to water your crops on sunny days when it isn't raining, but sometimes it will rain during the night. If it rains during the night, you will not have to water your crops, because they will already be damp. 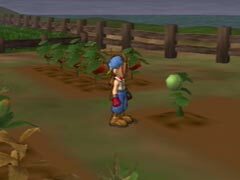 Make sure to pay attention to when you must water your crops, don't water the same square more then once each day and make sure not to plant seeds on rainy days because the rain will wash the seeds away.